The Earth’s largest land mammal can now be held in your hand in the form of this lovely blue elephant glass pipe. The little guy is the ultimate smoking buddy! 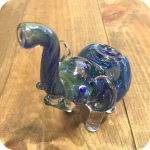 This blue elephant glass pipe stands up at about four inches from feet to trunk. 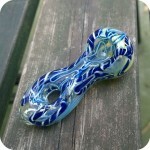 Clear, purple and green specks adorn this beautifully made blue glass pipe. 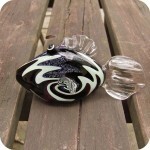 It comes with a very generous sized bowl, perfect for sharing with friends or keeping for yourself. Either way you can’t go wrong. With the carburetor on the back side of the piece and the elephants trunk as the mouthpiece, the shape of this pipe allows the user to easily and comfortably hold and smoke without feeling awkward like many animal pipes tend to. In fact, it almost feels like holding a sherlock. Finally, do not forget to swing by either one of our three Brooklyn store locations to see what else we have to offer! We are located at 12 Wilson Ave, 518 Grand Street, and 377 Metropolitan.Also. Be sure to check out some of our other elephant pipes (gold elephant, baby elephant). Remember, elephants travel in herds! 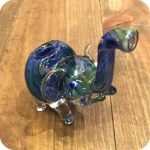 Tags: animal pipes, Blue Green Elephant Glass Pipe, Brooklyn, brooklyn glass, bushwick, bushwick head shop, Elephant Pipes, glass, Smoking Buddies, Sunflower Glass Co, Sunflower Glass Company.